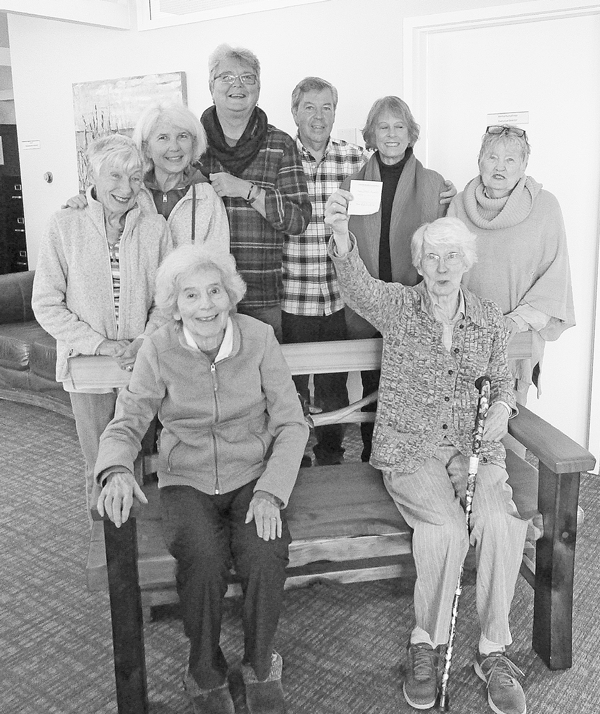 Celebrating the winning ticket in the annual Greenwoods Foundation garden bench raffle are residents Marian Gilbert, bottom left, and Nancy Wright (holding the winning ticket #559) and, standing behind them, foundation board members, from left, Pat Low, Jennifer Howard, Deb Stevenson, Rick Alexander, Ann Miller and Victoria Woodman. Lifelong Salt Spring resident David Walls was the lucky winner of the bench made by Salt Spring craftsman Luke Hart-Weller. Greenwoods thanks Hart-Weller and Macdonald Realty for donating the bench, and everyone who supported the raffle. Greenwoods’ annual appeal kick-off date is Nov. 1. This year’s project is to purchase a large modified van for transporting residents and to enhance community outreach programs. © 2018 Greenwoods Foundation • Email Greenwoods • Photo Credits: Slides 2, 5 and 9 are by Jen Holmes Modern Images and slide 3 is by Rachel Bevington, slides 1, 4, 6, 7 & 8 are by Shari MacDonald, and slide 10 is by Ken Jackson.